The mobile bar ‘Shaken & Stirred’ was set up in 2006 by former Hotel and Restaurant Management student Tom Abram ‘02 (pictured above). “During a wedding party, I noticed the amount of care and attention, not to mention money, which had been spent on the venue, the food, the flowers and decoration, but the bar seemed to be an afterthought. It consisted of a plain trestle table with warm beer and wine. As a cocktail bartender in a swanky bar, I thought why not have that at weddings?” and the idea behind 'Shaken & Stirred' was born. After some online research Tom managed to source a mobile cocktail bar. He took out a loan and purchased a bar and a van. "Through a friend of a friend I found a website designer in Argentina. He was an English guy living out there. I loved his contemporary designs and unlike some of the template based websites created by larger companies, his designs had a real personal touch”. Tom now owned a mobile bar, a van and a website. With a few dates booked in the diary it was time to put the concept to the test. 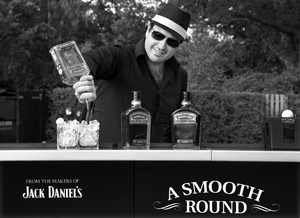 “I knew that I could run a bar and make good cocktails but adding in the events element was new territory to me”. The first booking was at the Brookes Restaurant on the Gypsy Lane campus. As part of the Hotel & Restaurant Management Course students have to put on a night of food and entertainment in the restaurant. “My girlfriend at the time had her event there and asked me to do the pre-dinner drinks. I forget what the actual cocktails served were but they went down very well”. 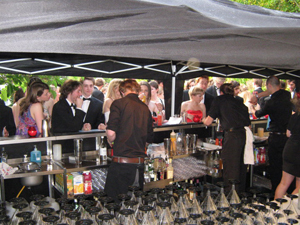 Shortly after, ‘Shaken & Stirred’ did their first full bar event at a wedding at Yarnton Manor. “The bar was a roaring success and we received such fantastic praise that I was blown away. It made me realise that I had stumbled onto a great idea and what we produced was good”. 7 years later ‘Shaken & Stirred’ has grown to having five cocktail bars totalling 12.5 metres, 30 or so part-time bartenders, a commercial warehouse where they rent out bars, equipment and glasses and produce bags of cubed and crushed ice to sell to restaurants, bars and festivals. 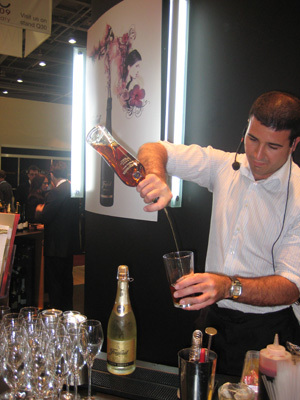 They have done hundreds of events for up to 20,000 people and have had recurring contracts with Jack Daniels, Bacardi, Freixenet, Courvoisier, The International Wine & Spirit Awards, The Royal Enclosure at Ascot and Jo Malone to name but a few.